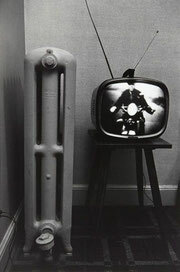 Since I only have seen one or two images from "The Little Screens Series" by Lee Friedlander, I recognized those images as a part of his other series. I realized that The Little Screens Series is a long time work from 60s to 70s by looking at images on review of his show at "Hyper Real - Art and America around 1970" in Aachen, Germany on We Make Money Not Art. The various shapes of those old TV screens also give charms on the series of photography, but something else also make these "scenes with screens" be different and standing out. I noticed that all of those screens show people or faces of people. I suppose those screens suggest existance of human in the scenes.